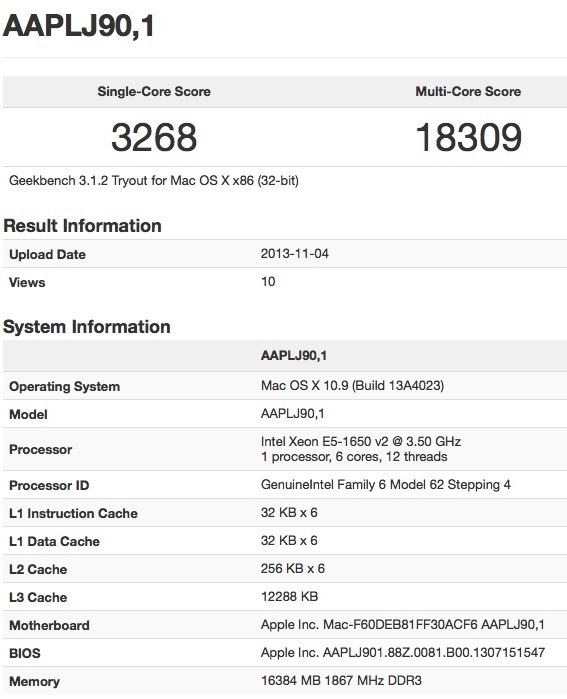 While Apple's new Mac Pro doesn't launch until next month, the machine continues to occasionally surface in the results database for the popular Geekbench benchmarking tool. The first appearance came in June just after the redesigned Mac Pro was teased at Apple's Worldwide Developers Conference, with that machine running the high-end 12-core 2.7 GHz Xeon E5-2697 v2 from Intel's Ivy Bridge-E family. And in late September, a second entry appeared sharing details on a Mac Pro running the 8-core 3.0 GHz Xeon E5-1680 v2 chip. A third Mac Pro entry has now shown up in the Geekbench results database, revealing the 6-core 3.5 GHz Xeon E5-1650 v2 chip that will also be an option in the new Mac Pro. As with the previously seen machines, this new Mac Pro is running a custom version of OS X Mavericks, build 13A4023. The machine's appearance leaves only the entry-level quad-core 3.7 GHz Xeon E5-1620 v2 yet unseen in early benchmarks. While both the 6-core and 8-core machines were tested using Geekbench 3.1.2 in 32-bit mode, which allows for direct comparison of their benchmarks, the 12-core Mac Pro was tested using Geekbench 2.4.3, which used a different baseline and means that scores can not be directly compared. But between the 6-core and 8-core machines, the two unsurprisingly show similar single-core scores of around 3300 in Geekbench 3, while the newly surfaced 6-core machine sees a lower multi-core score of 18309 compared to the 24429 seen on the 8-core version. The new 8-core Mac Pro had previously shown benchmark scores essentially on par with that of the highest-end 12-core Mac Pro models from 2010 and 2012, and while this new 6-core machine unsurprisingly falls short of that level, it does still easily top the fastest 8-core machine seen in the 2009 and 2010 models. New Intel Xeon processors are certainly not the only horsepower improvements included in the new Mac Pro, as all machines will come standard with dual AMD FirePro graphics chips. And with the Mac Pro able to tap into those chips for general computation tasks via OpenCL, users will see significant improvements in real-world performance. Apple's new Mac Pro launches in December, but the company has yet to announce a specific date in the month when it will become available. "While Apple's new Mac Pro doesn't launch until month"
You'd think with the billions Apple have in the bank that they'd be able to afford the full version of Geekbench. The writer accidentally the words. We can't decide on the new 12 core Mac Pro or a new coffee machine for the new kitchen. Why not both? Just run a Flash video and your Mac Pro's fan will blend those coffee beans like a pro. Everything can always be faster. Learn to read, it says a third party has released the results. It always makes my day to see some news about the Mac Pro on Mac Rumors. Can't wait to replace my Mac Pro 1,1 with one of these beasts. I wish Apple would announce a firm date in December, though. I can't believe that at this late stage they haven't got everything planned out. They must have all the logistics of manufacturer and distribution all arranged and good to go.